For 2015, GMC installs a standard heated steering wheel in the SLT-2 and Denali models, offers a new 20-inch aluminum wheel option, and will paint the SUV in one of three new colors. Five versions of the 2015 GMC Acadia are for sale: SLE-1, SLE-2, SLT-1, SLT-2, and the luxurious Denali model. Upgrade from SLE-1 to SLE-2 trim, and the Acadia includes IntelliLink connectivity, a power driver’s seat, a front center airbag, second-row captain’s chairs, remote engine starting, an auto-dimming rearview mirror, and a power tailgate. The Acadia SLT-1 adds projector-beam headlights, variable effort steering, heated side mirrors, and 19-inch aluminum wheels. Inside, this model has aluminum trim, leather seats, a power front passenger’s seat, heated front seats, automatic triple-zone climate control, a premium audio system with rear audio controls and headphones jacks, and a universal remote control. The SLT-2 adds key safety features including Side Blind Zone Alert and Rear Cross Traffic Alert, as well as a heated steering wheel and memory for the driver’s preferred settings. The Acadia Denali adds monochrome paint, satin chrome trim, and 20-inch machined-finish aluminum wheels. Illuminated aluminum doorsill trim plates greet the driver and front passenger, and the Denali features additional acoustic insulation, premium carpeting, perforated leather upholstery, ventilated front seats, leather and wood steering wheel trim, a heads-up display, and a dual SkyScape sunroof. Forward Collision Alert and Lane Departure Warning systems are standard for the Denali, along with a heavy-duty cooling system and a trailer hitch. Every 2015 GMC Acadia is equipped with a 3.6-liter V-6, one making 281 horsepower in SLE and SLT models, and 288 horsepower in the Denali version. A 6-speed automatic transmission delivers the power to the front wheels, and all-wheel drive is an option. GMC includes free scheduled maintenance for the first two years or 24,000 miles of ownership, too. No matter which Acadia model you choose, it is rated to get 19 mpg in combined driving by the EPA. 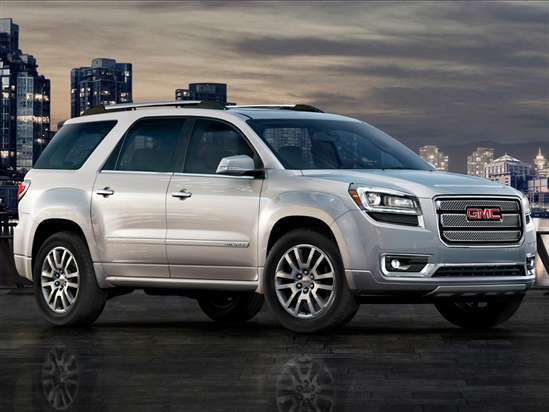 The GMC Acadia is a safe crossover SUV. In NHTSA testing, it receives 5-star ratings in each crash-test combined with a 4-star rollover resistance rating. The Insurance Institute for Highway Safety (IIHS) says it gets a “Good” rating in all evaluations performed to date. The IIHS has not assessed the Acadia for its ability to protect occupants in the small overlap frontal-impact test. The 2015 Acadia is equipped with a standard reversing camera, rear parking assist sensors, and OnStar with Automatic Crash Response service. A touchscreen radio is standard, too, and can be upgraded with IntelliLink technology, which is included for all but the base SLE-1 model. A navigation system is also offered for the Acadia. Safety-related features include Side Blind Zone Alert, Rear Cross Traffic Alert, Forward Collision Alert, and Lane Departure Warning. Unfortunately, the latter two features are offered only on the most expensive model, the Acadia Denali.